• Republicans Matt Barton and Jesse Vaughn speak on the importance of their runoff for the state House District 5 seat and the need for voters to listen in over the coming weeks. With Tuesday's state House District 5 special election now behind them, the campaigns of Republicans Jesse Vaughn and Matt Barton were extended for another month, with the candidates now heading back out to push their messages to voters before their Feb. 5 runoff. The runoff — to decide which candidate will fill the seat left open after the death of Rep. John Meadows — pits the two top vote getters in a six-candidate field against each other. Vaughn finished with 33.72 percent of the 3,520 votes cast in the special election to Barton's 23.15 percent. A runoff was the anticipated scenario both Vaughn and Barton expected heading into Tuesday, centering their attention on just being one of the two to secure a spot in it. Now with that accomplished, both candidates are encouraging voters to get out and hear what they have to say about their policies. "It's too important to not hear what we have to say," said Barton, the owner of courier business which focuses on the healthcare industry, in making the case for voters to ask questions and get to know both candidates. Vaughn, a local attorney who opened his own law firm in town more than a decade ago, shared in message of casting this election as one of extreme importance to Gordon and Murray counties, as well as Northwest Georgia as a whole. "This is my home," he said, adding that he plans to do the best job possible in supporting the constituents of House District 5. Both Vaughn and Barton said the weeks ahead will match much of what they've been doing since the special election was called in early December, speaking publicly on their principles and building critical relationships with community members. Vaughn compared his work as an attorney in the community with what he would do if elected — helping locals with problems they may have with the government. As a state representative, the role calls for not only supporting his constituents and responding to issues they may have, but to act as the voice in Atlanta for local governments and the elected officials who fill those posts. Barton, who previously served on the Calhoun Board of Education and City Council, brings business and political experience in his bid for the House seat, he said. "My main principle is to keep taxes as low as possible," he said. Barton followed this us by saying he aims to keep government from hindering the development and growth of business, allowing business owners to thrive on their own abilities. The two Republicans both mentioned education on Tuesday night, joining in their push to see that the state's funding formula for education is fully funded. "The primary investment as a state is in our future, in our children," Vaughn said, adding that he would like to see education broadened, specifically to build the workforce and ready students with professional skills needed to enter it. "How are we going to function if we don't have enough plumbers?" "We need to make sure teachers are supported ... and do not have to teach to the test," Barton said, adding he would like to see greater freedom granted to educators in cultivating students to perform well at life not just on exams. • An Adairsville woman faces charges of DUI and serious injury by vehicle following a two-vehicle wreck on Ga. 53 near Farmville Road earlier this week. An Adairsville woman has been charged with DUI and serious injury by vehicle after a Georgia State Patrol investigation determined alcohol was a contributing factor in a head-on wreck earlier this week on Ga. 53 near Farmville Road. Loretta Phillips, 44, of Adairsville, is also charged with failure to maintain a lane, driving on the wrong side of the road, open container violation and no proof of insurance. Additional charges to those filed Thursday are possible as the GSP investigation continues. Phillips had not been arrested as of Thursday afternoon. Phillips and the driver of the vehicle she collided with — Gina Ward, 29, of Calhoun, — were both seriously injured. Phillips was airlifted to Erlanger Hospital in Chattanooga, but was not listed on the patient roster Wednesday. Ward was taken to Hamilton Medical Center in Dalton, and was in good condition Wednesday. Phillips was driving a 2011 Kia Soul westbound on Ga. 53 when she crossed the centerline and struck Ward's 2005 Hyundai Santa Fe head on. Ward was driving the Hyundai eastbound on Ga. 53 and had one passenger in the car. Both Phillips and Ward were entrapped in their vehicles following the wreck. The Gordon County Fire Department removed both women from their damaged cars. The passenger in the Hyundai was not seriously injured. 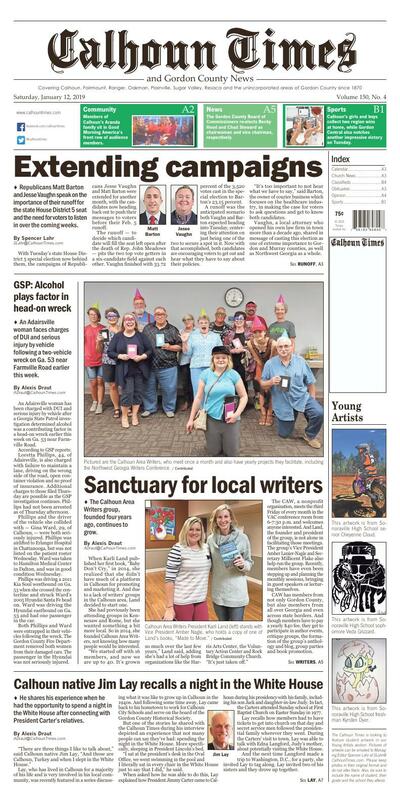 • The Calhoun Area Writers group, founded four years ago, continues to grow. Pictured are the Calhoun Area Writers, who meet once a month and also have yearly projects they facilitate, including the Northwest Georgia Writers Conference. Calhoun Area Writers President Karli Land (left) stands with Vice President Amber Nagle, who holds a copy of one of Land's books, "Made to Move." The 2017 Northwest Georgia Writers Conference author panel. When Karli Land published her first book, "Baby Don't Cry," in 2014, she realized that she didn't have much of a platform in Calhoun for promoting and marketing it. And due to a lack of writers' groups in the Calhoun area, Land decided to start one. She had previously been attending groups in Kennesaw and Rome, but she wanted something a bit more local. So in 2014, she founded Calhoun Area Writers, not knowing how many people would be interested. "We started off with 16 members, and now we are up to 40. It's grown so much over the last few years," Land said, adding she's had a lot of help from organizations like the Harris Arts Center, the Voluntary Action Center and Rock Bridge Community Church. "It's just taken off." The CAW, a nonprofit organization, meets the third Friday of every month in the VAC conference room from 6-7:30 p.m. and welcomes anyone interested. And Land, the founder and president of the group, is not alone in facilitating those meetings. The group's Vice President Amber Lanier-Nagle and Secretary Millicent Flake also help run the group. Recently, members have even been stepping up and planning the monthly sessions, bringing in guest speakers or lecturing themselves. CAW has members from not only Gordon County, but also members from all over Georgia and even across state borders. And though members have to pay a yearly $40 fee, they get to participate in author events, critique groups, the formation of the group's anthology and blog, group parties and book promotion. And since their origination, the CAW has grown in size but also in local involvement. This year, they will be publishing the third edition of their annual anthology, "Telling Stories," which consists of local writers' work. In 2017, they hosted the first annual Northwest Georgia Writers Conference, a wildly popular event where local authors are invited to Calhoun to lecture and lead writing workshops. In addition, they are looking into setting up a few "Little Free Libraries," an increasingly trendy movement where small decorated boxes are set up around a specific area containing free books available for exchange. Land specializes in writing Christian nonfiction, devotionals, children's books, blogging and fiction based on her own personal experiences. Her most recent project is a fiction book on a daughter caring for a mother with Alzheimer's, "Day After Yesterday," which is based on a nine-year period of time when Land helped care for her grandmother, who was an Alzheimer's patient. "If someone would have told me about those (life experiences), I might have been better prepared," said Land, who's now working on getting her manuscript published. "I want to try to help others get a glimpse of what might be coming." And professionally, Land not only serves as the president for CAW, but she also works as a project assistant for the Council on Alcohol and Drugs and discipleship director at Rock Bridge Community Church. Only living in Calhoun since 2012, Land is heavily involved in the community and credits her history of writing to her grandmother, who served as her muse. "My first moment of inspiration was when I was a little kid, we used to walk around the block every day and (my grandmother) would read these little stories she had written down," Land said. "That was my first experience with writing." And while her grandmother inspired her, the other reason she continues to write is so she can help people. "We go through things and that's our purpose," Land said. "We can take those things and use them to help somebody who is going through (something similar) or coming into a tough season." Land, a Florida native, lives in Calhoun with her husband, four children and one grandchild. Of all the things she's involved with, she knows that CAW has its own unique quality. "There's something about our group," she said. "It's just really special." CAW's 2019 Northwest Georgia Writers Conference will be held in September and details will be released at a later date. • He shares his experience when he had the opportunity to spend a night in the White House after connecting with President Carter's relatives. "There are three things I like to talk about," said Calhoun native Jim Lay, "And those are Calhoun, Turkey and when I slept in the White House." Lay, who has lived in Calhoun for a majority of his life and is very involved in his local community, was recently featured in a series discussing what it was like to grow up in Calhoun in the 1940s. And following some time away, Lay came back to his hometown to work for Calhoun City Schools and serve on the board of the Gordon County Historical Society. But one of the stories he shared with the Calhoun Times during his interview depicted an experience that not many people can say they've had: spending the night in the White House. More specifically, sleeping in President Lincoln's bed. "I sat at the president's desk in the Oval Office, we went swimming in the pool and I literally sat in every chair in the White House just to say that I did," he said. When asked how he was able to do this, Lay explained how President Jimmy Carter came to Calhoun during his presidency with his family, including his son Jack and daughter-in-law Judy. In fact, the Carters attended Sunday school at First Baptist Church on Easter Sunday in 1977. Lay recalls how members had to have tickets to get into church on that day and secret service men followed the presidential family wherever they went. During the Carters' visit to town, Lay was able to talk with Edna Langford, Judy's mother, about potentially visiting the White House. And the next time Langford made a trip to Washington, D.C., for a party, she invited Lay to tag along. Lay invited two of his sisters and they drove up together. "We pulled in front of the White House and the guard opened the door and said, 'We're so glad you're here Mr. Lay, we've been expecting you,'" Lay said. "I was just an old country boy. I couldn't believe I was able to do this." During his stay, Lay was able to talk to the butlers who served dinner and asked them to tell stories about previous presidents and the Carters. One of the butlers ex - plained that the dishes they were using belonged to President Truman. "Hoover built a sunroof on the top of the White House, it has windows all around it, and you can't see it from the outside," Lay said. "But anyway I stood there with a Budweiser and walked all around the outside of the building at night. There were 16 acres and it was quiet as can be, just magnificent." This visit to the U.S. capital is one of Lay's most cherished memories, especially since he was able to make phone calls from Lincoln's bedroom. And while tours of the White House are available to the general public today, not many can say they've slept in President Lincoln's bed or drank a beer under Hoover's sunroof. After years of serving city schools and the historical society, Lay rarely utters a negative word about being in Calhoun for almost his entire life, instead choosing positive outlooks on his experiences. But he does boast about this special trip he made with a relative of President Carter and his own sisters — to stay in the White House for a night. This artwork is from Sonoraville High School senior Cheyenne Cloud. This artwork is from Sonoraville High School sophomore Veda Grizzard. This artwork is from Sonoraville High School freshman Kyrsten Dyer.